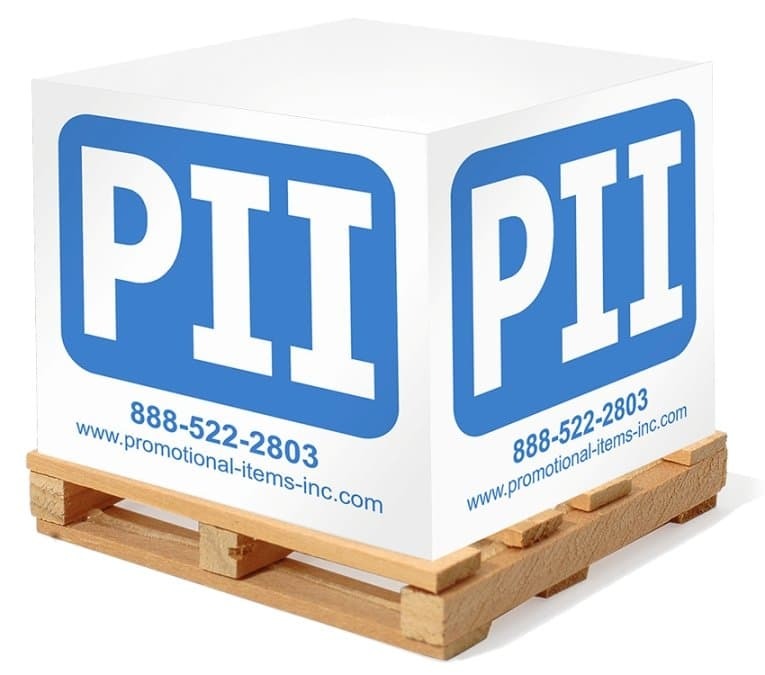 Promote your logo LARGE w/ this notepad cube wood pallet. Features 60 lb White paper, wood pallet - 790 sheet notepad. Size is 3 7/8" x 3 7/8" x 3 7/8". Shrink wrapped, bulk packed. Pallet notepads are a great promotional item for business. Why? It is a promotional product for the desk used daily. Delivery from date of order for pallet cubes is 3 weeks. This product is Made in the USA - quality assurance. Price includes one color imprint on four sides 3 5/8" w x 3 5/8" h.
No Factory Setup and one to four designs on the four sides. One color sheet print area 3 1/2" x 3 1/2" add $1.99 each. Logos do require factory ready Illustrator ai, eps or pdf. The online advertisement was pretty detailed and my expectations were high that we were buying a notepad on a wood pallet that would dwarf any of the competitors regular notepads. Well I am never wrong and was most certainly right. This promotional product is just what we needed. Good paper, good printing, good wood pallet and LARGE, can't miss it on a customer desk. Being a freight company we have to keep out ahead of the competition and this product does the job very well.